This amazing 0.25 Carat t.w. brilliant round cut pave filled Diamond heart slide features 11 radiant Diamonds accented by lustrous highly polished white gold. 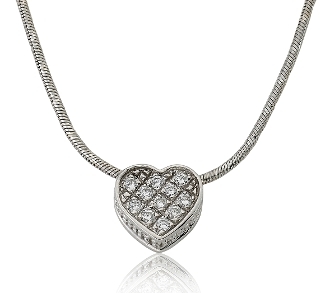 This slide pendant has fabulous texture with dual rows of beading round the outer rim of the heart. The sleek 16 inch, 1.1mm thick snake chain sparkles and shimmers with Diamond cuts throughout. Crafted in 14 Karat white gold the snake chain slides through the top of the heart and secures with a small lobster clasp.